Don’t you just love a good set of neutrals? J.Crew and Theory are two of my favorite go-to’s for the best basics and foundation pieces in my closet. For example, this new tunic sweater at J.Crew comes in a bunch of great shades and is under $90. It’s lightweight and long, perfect for wearing with white jeans or jean shorts come spring, but a great layering piece for right now! At Theory, this chevron-stitched sweater is a creamy delight that I would just love to add to my wardrobe right this second (and it’s on final sale)! Another piece I am adding to my shopping cart is this silk striped blouse – another practical item for your year-round wardrobe. What are your favorite places to shop for basics? Love this neutral look, that skirt is so fun! In love with your whole outfit! You look amazing and stylish! This neutral color combo is so dreamy & luxe – it looks gorgeous on you! I am in LOVE with this outfit! That skirt is just stunning! I may have to get my hands on it! Gorgeous color combo! love this timeless and super classy look! Have a fun and safe trip!!! You look gorgeous! What a great color combo! I have very similar sunnies and they’re my favorite–I love how retro they feel! absolutely gorgeous! love the color palette. can’t wait to follow along on your NYFW adventures. Have so much fun at NYFW!! Hope your flight doesn’t get cancelled! And as for this outfit– so cute and cozy! I just got that J.Crew coat on sale and I love it! These colors are PERFECTION! How many darn Chanel bags do you own!?!?! Soo jealous! Love! Gorgeous! Love those new J. Crew tunics..always looking for something to wear with our pixie pants. Great neutrals! Have an awesome tome at New York Fashion Week! 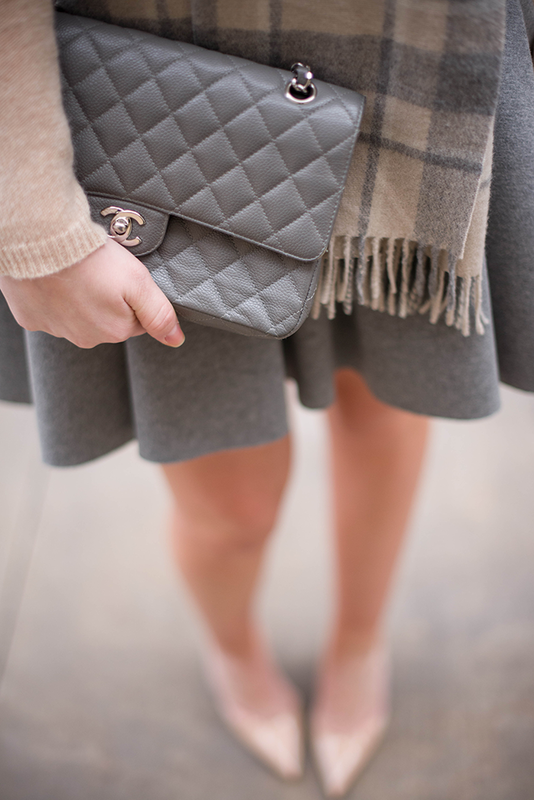 Love the grey box pleated skirt, I have had my eye on purchasing one! I hope you get here safely!! I look forward to meeting you :) And can I say I adore this color palette, so serene and cozy. Love these neutrals together! This outfit looks so cozy too. NYC is pretty gross right now, so bring layers :) Have a great trip! Such a lovely look! The skirt, the jacket, the scarf! Love it all! By the way have fun on your trip!! what a great outfit, i love how you stuck to a few simple colors! your celine sunglasses look fabulous! have a great time in nyc! You look gorgeous! Love this neutral look. Have so much fun in NYC! I’m super jealous! I can’t wait to follow/stall you on Instagram during Fashion Week – you’re gonna have so much fun! Also, this outfit is amazing – love that bag! this is one of my fave outfits. So elegant and beautiful. Yet modern and chic. have a wonderful time in NYFW. Stay warm. And can’t wait to hear all about it. Completely obsessed with this color combo! I just redecorated our master bedroom in it. So classy. LOVE that scarf! Love the entire outfit! So pretty! Love this look. It reminds me of Blake Lively. You look amazing. Have fun at NYFW! Pingback: january monthly goals + december recap - Bubbly Design Co.